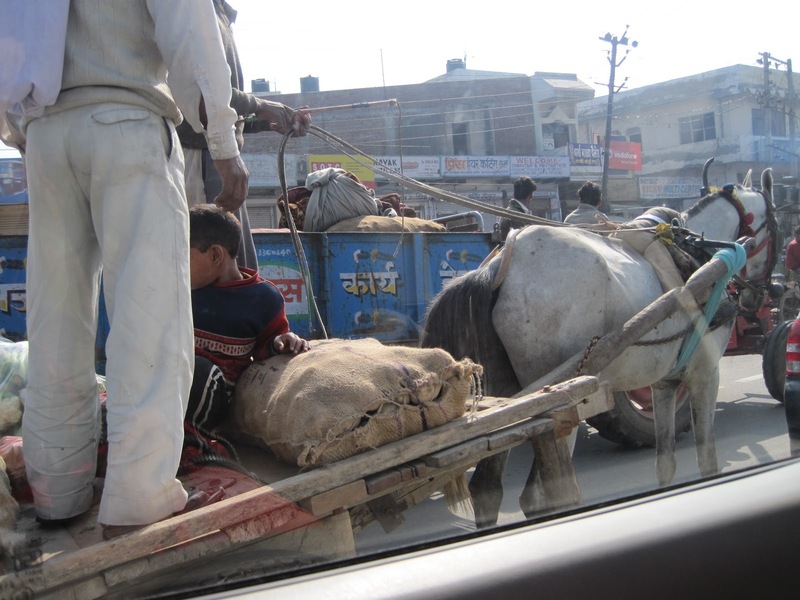 On saturday Feb26, I was determined to go to Agra. The journey took me 4 1/2 hours. Left Taj Palace Hotel in Delhi around 8:30am and arrived in Agra at 1pm. Just me, and the driver from DTA Travel (Company's travel agent). Passed through kampung, small towns, ladang gandum, etc. 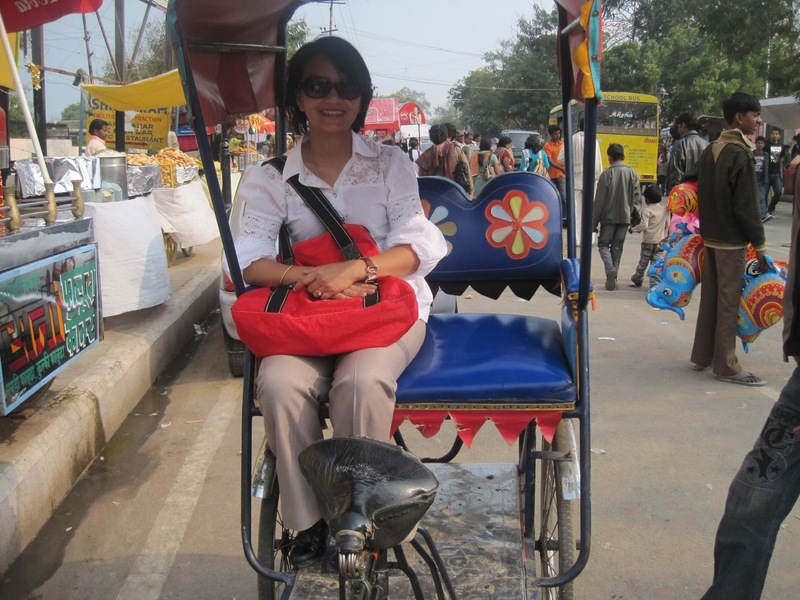 Jumpa all sorts of transportation on the road.. keta kuda, keta lembu, keta keldai, motor kapcai, beskal, lori buruk, bas yg mcm sardine, tuk tuk pun byk.. tuk tuk ni kapasiti dia 3 org je, tapi.. depa sumbat sampai 9 orang! tengok la tu, separuh badan kat luaq. 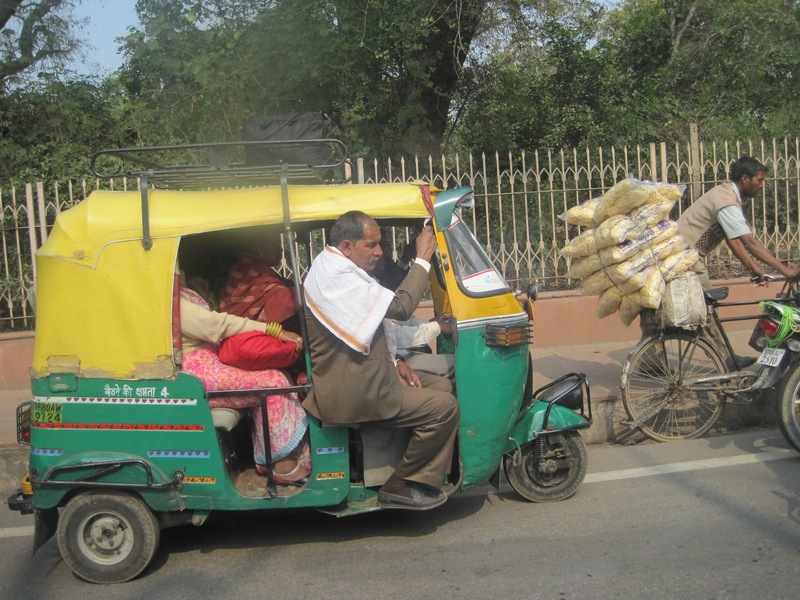 My driver pun sampai muntah kat tepi jalan nak menyampaikan ke Agra.. org bandar (Delhi) la katakan, tak biasa kot.. Makcik jugak yang steady.. 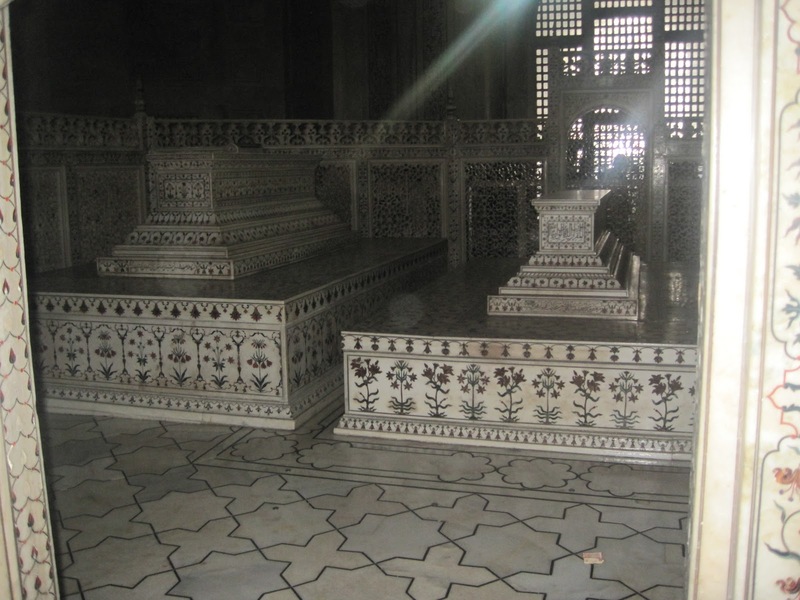 Anyway, before sampai Taj Mahal, the first stop was Akbar's (atuk Shah Jehan) tomb, at Sikandra (suburb of Agra). Gate dia lebih kurang Taj Mahal gak.. Nak masuk kena bayar Rs. 150 (around USD4). The tomb building is a four-tiered pyramid, surmounted by a marble pavilion containing the false tomb. The true tomb, as in other mausoleums, is in the basement.The buildings are constructed mainly from a deep red sandstone, enriched with features in white marble. Zaman dulu2 punya architecture, but nice. The decoration is full with ayat2 suci Al-Quran... And here I was introduced to may local Agra tour guide, a young good looking man in his 20's, an MBA student with high ambition.. quite interesting he had a lot of passion in explaining the history to me. His name is Rahul... hahaha, mcm hero bollywood. Then, we continued the journey to Taj Mahal.. The entrance fee for foreigners is Rs 750 (abt USD20) whereas for locals, Rs20 (tak sampai RM2 inggit) jer! ... Security check is very thorough. 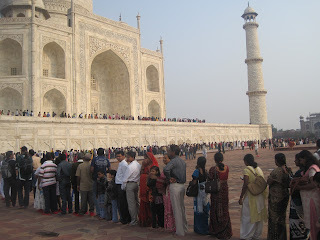 Taj Mahal is situated in Agra, in the Uttar Pradesh State. It was built from pure white marble by a Muslim Emperor Shah Jahan (died 1666 C.E.) 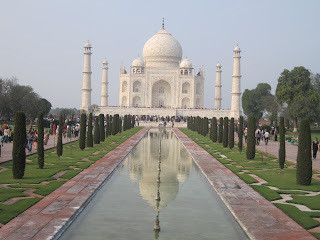 in the memory of his dear wife and queen Mumtaz Mahal at Agra, India. 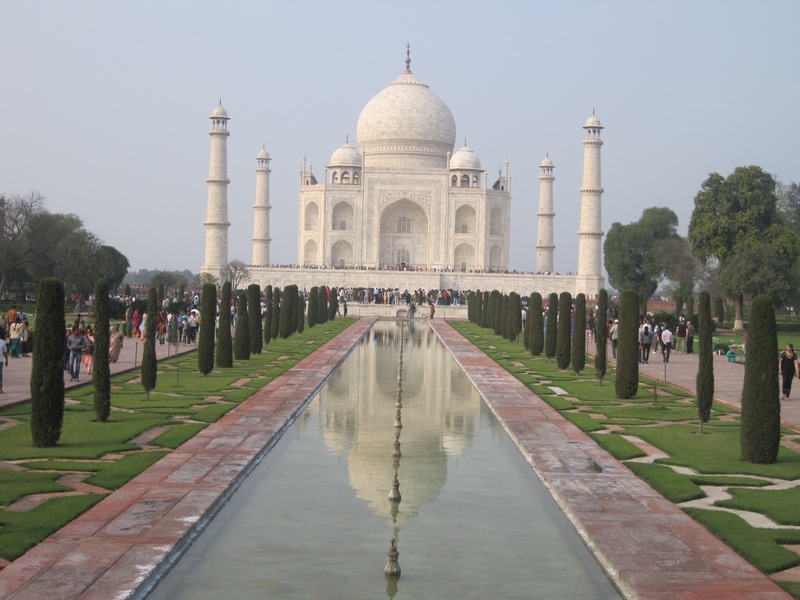 Taj Mahal means Crown Palace is a Mausoleum that houses the grave of Mumtaz Mahal at the lower chamber. The grave of Shah Jahan was added to it later. 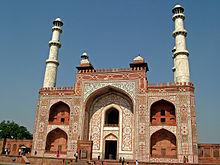 Shah Jahan's real name was Shahab-ud-din. Taj Mahal was constructed over a period of twenty-two years, employing twenty thousand workers. Construction started in 1631 and completed in 1653 at a cost of 32 Million Rupees at that time. Many renowned Muslim craftsmen worked on many specialized tasks. This is one the few places that made you proud being a Muslim.. Imagine zaman dulu2 dah ada ummat yg boleh buat magnificent building like this..! The entire mausoleum (inside as well as outside) is decorated with inlaid design of flowers and calligraphy using precious gems. The main archways ada banyak passages from the Holy Qur’an and also a lot of work of flowery pattern, give a captivating charm to its beauty. The central domed chamber and four adjoining chambers include many walls and panels of Islamic decoration. 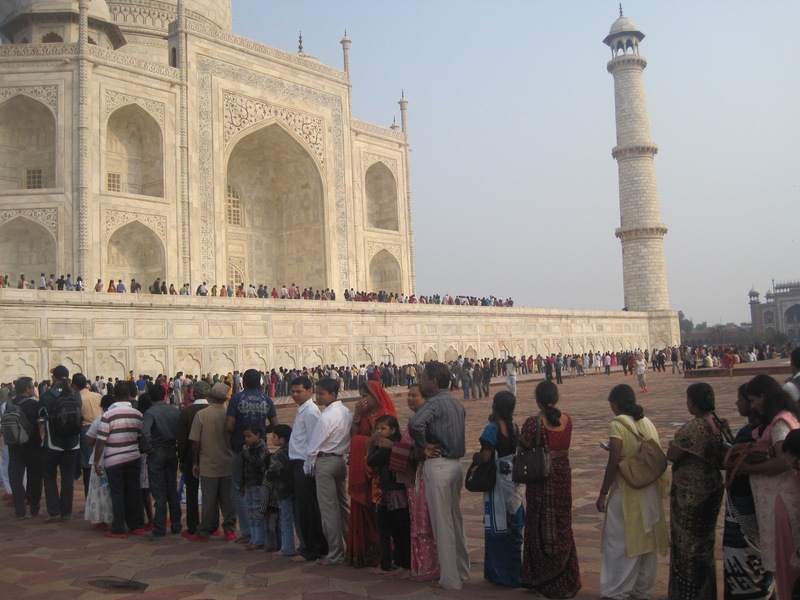 Tapi nak masuk ke mausoleum tu, ya Allah berkilo2 meter queue that day.. this is the proof! The mausoleum is a part of a vast complex comprising of a main gateway, an elaborate garden, a mosque (to the left), a guest house (to the right), and several other palatial buildings. 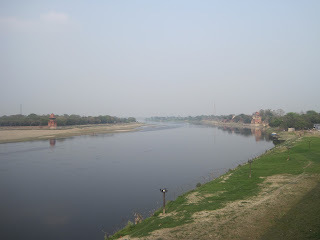 The Taj is at the farthest end of this complex, with the river Jamuna behind it. When I was there, it was about sunset. The best time to see Taj is during sunrise & sunset... beautiful. You've got to come and see for yourself before you can appreciate the beauty of it. Ni tomb olok2 Mumtaz & Shah Jehan (yg betul punya at the basement). Mumtaz punye betul2 at the center. 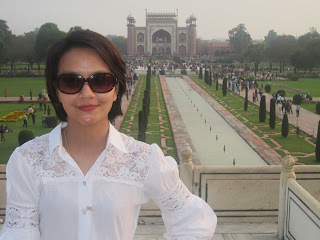 So Shah Jehan nye kat kiri sikit (as Taj Mahal was built by him for his wife, not for him). Tapi his daughter yg alihkan dia ke situ.